The underwater hull profile's an unusual blend of deep-vee and tunnels, and you could spend hours arguing how it works. In the end, though, there's no denying the Turbocraft's whisper-quiet ride - and its sure-footedness in high-speed cornering. Lawrence Schäffler reports. The invitation to check-out Turbocraft Ltd's new five-metre boats did - we have to confess - leave us a little confused. Turbo? As in a new, outboard-independent unit that somehow boosts engine performance? As it happens, that description is not too far off the truth - but it's not what you think. The boats do exhibit impressive handling and performance, but it's a result of the underwater hull profile rather than any outboard add-on. 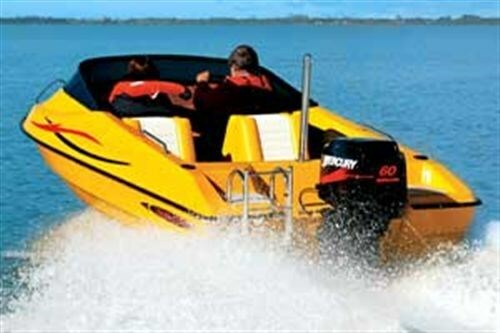 The Whangarei company is owned by Terry Hickey - a man with an extensive history in the Australian and New Zealand powerboat racing industry. In fact, when the racing heritage is explained, the Turbocraft's smooth ride and water-hugging performance begins to make some sense. Hickey has been producing two versions of the fibreglass boats since October last year - a conventional runabout (the X-16), and a cuddy cabin (C-16). Both have identical hulls, though with its superstructure, the cabin model is 50kg heavier (400kg). Both have quickly developed a reputation for performance, and are being sold through a number of dealers in the North Island. Originally from the UK, Hickey moved to Australia as a youngster and did a boating apprenticeship in the 60s at Brisbane's BJ Thompson Boatbuilders. A self-confessed petrol-head, he spent much of his time dreaming about racing and boat design. So when his boss (Bill) started musing about buying a 14-foot racing boat, Hickey talked him into what was, at the time, a "revolutionary" tunnel hull, even though there weren't any in Australia. Hickey would design and build it. He also agreed - on Hickey's insistence - to go with the new-fangled "sandwich" construction and the new Daycell foam. The result - Supercat - did surprisingly well, but Hickey's reputation really took off with his next design for Bill - a 14-footer with a radical deep vee flanked by two small wings (like a trimaran) on either side of deep tunnels. Pacific Pacer was immediately competitive and held the Australian championship title for a number of years. In the 70s Hickey moved to New Zealand and joined Auckland's Mini-boat club. He designed and built a miniature (nine-foot) version of Pacific Pacer - and called it Wings. Fitted with a 20hp Mercury and a stainless prop, it went like a rocket and gave Hickey the Mini-boat championship title. By then he'd formed a boat-building company in Whangarei and was building the mini-racers on a production line. The company was also building another of his designs - the 15-foot Manta. The latter was immensely popular, and at its peak the company was taking orders for four a week. Some 300 Mantas were built. The dream ended when Prime Minister Robert Muldoon introduced a 20 percent tax on new boats. Orders dried up, so Hickey went back to Australia for a few years before returning to New Zealand. After a period of boat-building and working on superyachts, he designed and developed the tooling for the turbo hull - the X-15 - and established Turbocraft Ltd. The first boat was launched in October last year. An enhancement on earlier designs, the hull displays a prominent deep vee - with pronounced channels or "tunnels" between centre "pod" and the wings and hard chines on the outside. It's a very subtle profile, however, and is more easily observed from the transom end. Hickey calls it a "turbo-lift" hull - one that offers the best of both worlds. "The central, deep vee hull cuts through steep chop offering comfortable cruising, while the tunnels create a turbine-like effect, funnelling the air through and under the hull, cushioning the ride." Whatever the scientific explanation for the aero- and hydrodynamic forces at work on the hull, it offers a remarkably quiet, smooth ride. It tracks unerringly and the outside wings and chines "grip" the water very effectively. 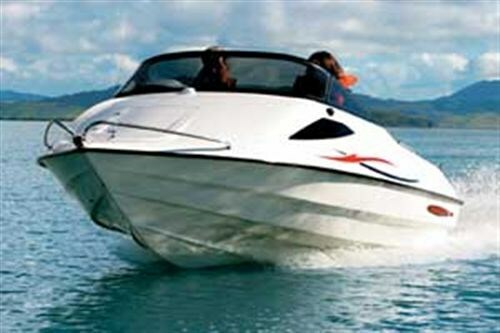 The boat does tight turns at 50mph without a hint of slippage or cavitation, and stays relatively flat. The wings also provide plenty of buoyancy and stability: two adults (combined weight around 190kg) standing on the side of the cockpit created very little list - not bad for a five-metre boat. Both models are created from mating a one-piece hull to a one-piece deck. These are riveted and bonded, and then strengthened with a number of interior fibreglass components. 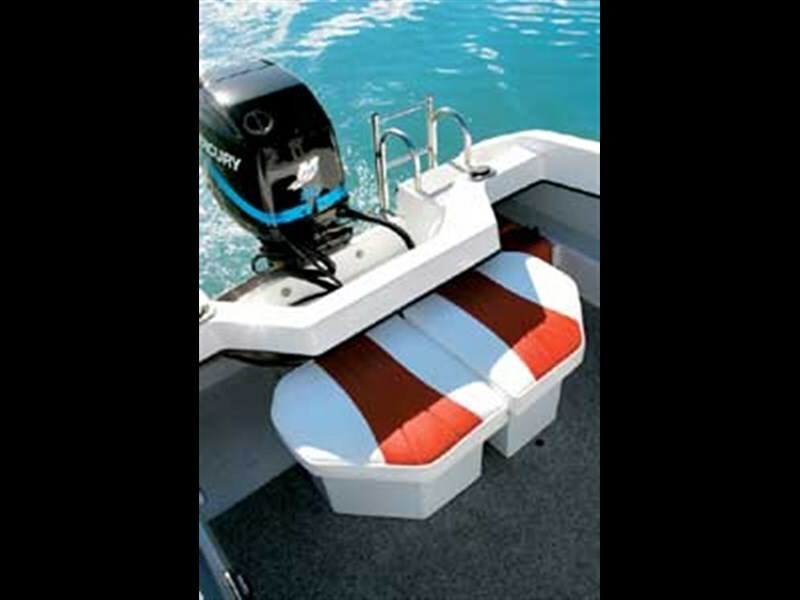 They include two head (bench) sections for the forepeak area, an anchor locker, fibreglass stringers, two side pockets, and middle stowage and buoyancy compartments. Spaces between the compartments are pumped full of foam to reduce noise. The hulls use hand-laid chop strand and woven roving (to promote consistency of density/weight). Decks use core mat. 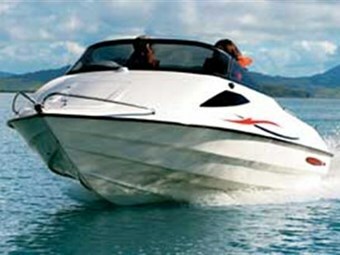 Hulls are provided with a five-year structural warranty, and the company is currently applying for CPC certification. Our test - at Whangarei's Onerahi - took place in relatively benign conditions, so we can't speak for the boat's performance in choppier seas. But Silverdale dealer Murray Tonkin (Boats R Us) has put the C-16 through its paces in rougher stuff (a metre swell) and says its performance is "awesome". The runabout X-16 was fitted with a 60hp Mercury, and the slightly heavier C-16 with a 90hp Mercury - reflecting the limits of the recommended horse-power range. The runabout displayed a healthy turn of speed and acceleration - the 90hp gives the C-16 an eye-watering performance. At 5500rpm the X-16's speedo showed 35mph. At the same revs the cabin version ran 10mph faster, and at 6000rpm it skimmed along at 50mph. From dead start, the C-16 climbed onto the plane in less than two seconds. As suggested, the hulls (with all that foam) eliminated the effects of "slap" - and were refreshingly quiet. But their stand-out feature, for me, was their ability to hug the water through even the tightest turns. Engenders lots of confidence in the driver. 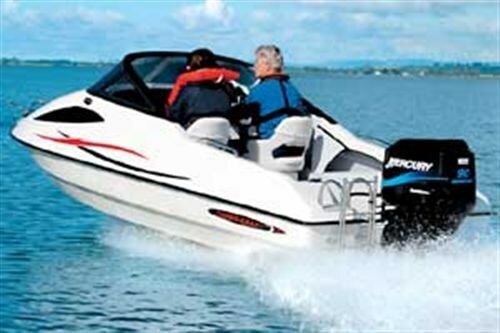 They'd make good ski-boats (they're equipped with ski poles), but Hickey has also fitted rod holders, and the cabin version, in particular, is an excellent general-purpose boat. It's also fairly light, and easy to handle. Compared to the C-16, the runabout is a much more basic boat and has a relatively spartan layout. Its large cockpit is fitted with a pair of double-backed, padded seats that tilt up to reveal plenty of storage underneath. More stowage space is available in the cockpit's side pockets, as well as in underfloor compartments. Floors in both boats are finished with marine carpet. The floor of the X-16 ends rather abruptly in a one-piece footrest, just forward of the dash, leaving a large, cavernous space forward. This section - with its anchor locker - seems "unfinished" and the space and could be better utilized if a more formal stowage system was installed. A hatch set into the foredeck is for tending the anchor. The wrap-around, tinted windscreen and GT dash combine well and add to the boat's overall streamlined styling. A fold-up boarding ladder is mounted on the port side of the transom. In the C-16 version, a pair of pedestal, swivel seats replace the padded back-to-back seats of the X-16. The seats are set above robust, polyethylene bases (with inside storage), though Hickey plans to change these to fibreglass models (for aesthetic reasons). The cabin version is also fitted with two padded rear seats (they double up as fish bins) that can also be deployed as a central, bench seat. The cabin is fitted with two benches with squabs, and as with the X-16, a hatch has been set into the foredeck for anchoring duties. Two side windows allow light into the cabin. Unlike the runabout, the cabin boat has a four-piece windscreen. The dash is dominated by the walnut wheel, and complemented by Mercury instrumentation: speedo, revs, hour meter and engine trim. There are toggle switches for the navigation lights and the bilge pump. This boat was also fitted with a Hummingbird M87 C GPS fishing system and a Cobra DSC VHF, but these are optional extras. Access to these electronics is through a hatch set into the cabin bulkhead. As with the runabout, there is a pair of rod holders and underfloor stowage bins. Both boats use tote tanks, but if required, the centre stowage compartment could be used for a built-in, 100-litre aluminium tank. Both boats are supplied with Dunbier aluminium trailers. All in all, the Turbo-craft boats are neat and solidly-constructed and exhibit performances that can be traced directly to Hickey's racing heritage. They're fast, stable and easy to handle. And as relatively light hulls, they should help their engines to good levels of efficiency. Hickey has bolted a tag-line to his company's logo: "Turbocraft - the shape of the future". Quite a bold statement, but I have the feeling we'll be seeing a lot more of these turbo-charged hulls in the future.